​Lately, my soul has been feeling pretty weary. Some things have crept in and drained my joy, my peace and my motivation. And I need to rest, replenish and refuel my weary soul. I feel the need to just set all the chaos, demands and drama of everyday life aside and search out some alone time with God. It’s summer-time and I recently saw a picture of a friend quieting her schedule and enjoying some time looking out over the beautiful blue ocean from the cruise ship deck. And another sitting quietly with God and her Bible as the day slowly awakened with a picture perfect sunrise over the mountains. Still another was rejuvenating with a new devotional and peaceful waves lapping against her toes buried in the sand, alone on the beach. But I’m not on a cruise ship, in the mountains or dipping my toes in the sand, and don’t foresee to be any time soon. How about you? I may not be going to any of those places, but isn’t it wonderful that I don’t have to “go” anywhere to spend time with God – He meets us right in the middle of where we are. In the middle of our little mess, in the middle of that round of chemo and even right smack dab in the middle of that stressful relationship. God comes to us, we just have to stop long enough to be with Him. ​Stopping… is that as difficult for you as it is me? How about just slowing down? It can seem impossible, but is it so essential. Just as we fill our cars with fuel to keep them running, so we need to be filled with soul fuel to keep us running. And can I just say, I can see the “low fuel” light blinking over there in the corner of my soul. Where is your soul fuel gauge registering? So I am going to take the next seven days to refuel. To be intentional about spending time with God and in His Word, and meditate on these seven scriptures. Would you like to join me? And invite a friend – or two or three or more – also. Let’s take this journey together. "My presence shall go with you and I will give you rest." "Stand by the ways and see and ask for the ancient paths, where the good way is, and walk in it; and you will find rest for your souls." 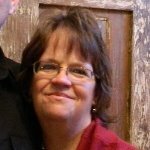 "Yes, brother, let me benefit from you in the Lord; refresh (rest) my heart in Christ." "Come away by yourselves to a secluded place and rest awhile. (for there are many people coming and going, and they did not even have time to eat)"
"Only in returning to me and resting in me will you be saved. In quietness and confidence is your strength." "Be still before the LORD and wait patiently for him; fret not yourself over the one who prospers in his way, over the man who carries out evil devices!" 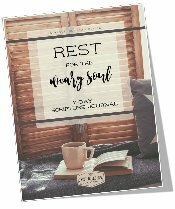 I’ve put together a Soul Deep mini-Scripture Journal for this week, and I’d like to share it with you. 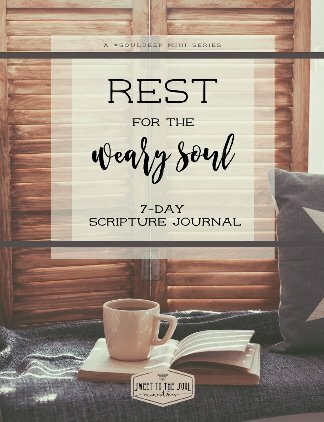 It’s a place where you can read each day’s devotional, mediate on the day’s scripture, and journal how God is speaking to you about applying His teachings to your life. 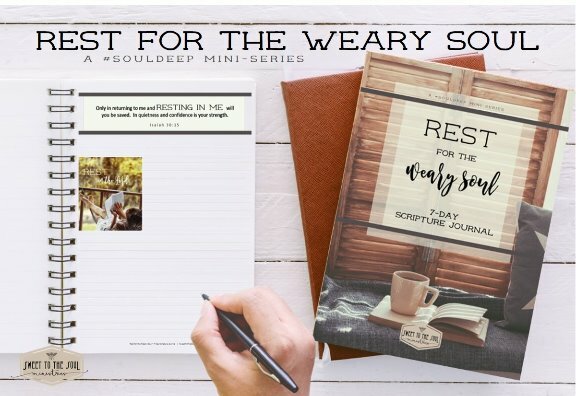 Click here to download your FREE copy of the Soul Deep mini-Scripture Journal “Rest for the Weary Soul”. I've become weary and bone tired this past week. This is JUST what I needed. Your timing is amazing! Thank you friend. Yes! He knows just what we need and is there with abundant provision. I am doing it tough at present. Trust your book and the verses it points me to will refresh my soul. God provides what I need just when I need it. His timing is always right and He leads me to people who can help. Have a great day basking in His love for you. so thankful you came by today! Praying God refreshes you greatly!